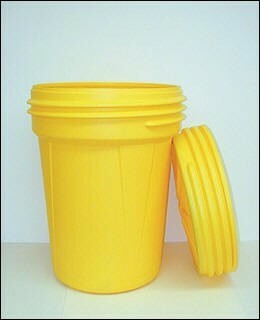 Lab Pack Drums in 15 Gallon Drum, 20 Gallon Drum and 30 Gallon Drum Sizes. You need lab pack drums if you manage any operation that uses small containers of dry cleaning compounds, strippers, pool chemicals, acids, inks, dyes, degreasers, pesticides, paints, thinners, solvents, bases or any other hazardous chemicals. Laboratories, medical facilities, warehouses, schools, factories and service businesses that accumulated hazardous chemicals in small (usually under 10 gallons) jars or cans that are contaminated, out-of-date, leaking or are no longer needed should have a plan for proper disposal to avoid penalties. Small quantities of chemicals cannot be disposed of in the trash or down the drain. Lab pack drums are used to store the material in until it is legally disposed of. Our 15, 20, and 30 gallon drums are chemical and weather resistant. They are made of high density polypropylene and are UV protected. All lab pack drums are in compliance with DOT regulations so your waste is safe to transport to a hazardous waste disposal facilities as long as it is properly packaged, labeled and shipped according to DOT regulations. If any of the chemicals are leaking, proper absorbents must be used in the container. No free liquids. 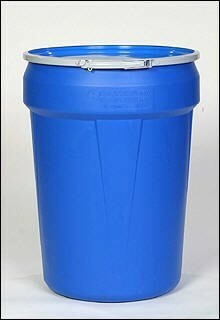 Our lab pack drums come in 15 gallon, 20 gallon and 30 gallon sizes. Lid types are plastic lever lock, metal lever lock and screw on lids. See our complete selection of poly drums as well as the lab pack drums product comparison chart at the bottom of the page. If you do not see the poly drums you need or have a specific need contact us toll free at (800)869-9633 or by email. Click these links to see our complete line of absorbents andsafety storage cabinets. Available in 14 gallon, 20 gallon and 30 gallon sizes. Types of lids include screw top, plastic lever lock and metal lever lock. Yellow in color except for two blue models. Thank You For Trusting Absorbents Online!